Born and raised in Santa Barbara, DJ Darla Bea began her party on the airwaves in 2008 hosting a weekly radio program on KCSB-FM 91.9. She has been DJ'ing private parties, weddings, themed and corporate events for over 6 years. DJ Darla Bea works with top event planners and wedding coordinators in the 805 area including Jill Remy, Zohe Felici and Katie Seefeldt. She worked closely with Gavin Roy, the coordinator and couple-to-be for a Rock 'n' Roll Fantasy themed wedding for Vince Neil of Motley Crue's daughter at the Montecito Biltmore, complete with an Elvis impersonator. Brides and grooms love her attention to detail; playing songs that evoke both their personal style and theme of the wedding. Parents and guests love Darla Bea for her appropriate choices and packed dancefloors. Darla's selections perfectly compliment the mood and transform each wedding into an A-List event. She is sought after for traditional Jewish and Latino weddings alike. Her song selections and DJ work with MC John Palminteri at KEYT News Channel 3 Anchor Victoria Sanchez's reception at the Fess Parker Double Tree even made the 6 O'Clock news. 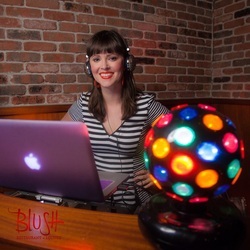 DJ Darla Bea is the go-to DJ for corporate parties and non-profit fundraisers. Recently Darla DJ'd a set at Deckers Brands for the Boys & Girls Club fundraiser. She has worked extensively with the Santa Barbara International Film Festival DJ'ing their Holiday Party and Jennifer Aniston After-Party in the UGG® Lounge. Her work with the Downtown Santa Barbara Organization includes DJ'ing their Spring and Fall Mixers. Darla has been on the scene for most First Thursday celebrations - playing artfully crafted tunes at the Museum of Contemporary Art, SB Arts Commission and Art from Scrap. Her B.A. in Art History & Architecture comes in handy at gigs like these. She has residencies and/or has DJ'd at the following venues, including: the Four Seasons Biltmore Santa Barbara's Ty Lounge, Blush Restaurant & Lounge, Blind Tiger (90's), Blue Agave, Figueroa Mountain Brewery, Mercury Lounge (80's), the Funk Zone's Seven Bar & Kitchen (Funk, R&B), Whiskey Richards (Rock), and Cafe's Del Pueblo and Muddy Waters (Latin, Ska, Hip Hop). DJ Darla Bea regularly organizes themed music nights in local nightclubs that are planned right down to her colorful costumes and a grab-bag of props and decorations. Her "Blue Sunday" 80's night at Sama Sama Kitchen was at capacity, "Saturday Nite Fever" at the Marquee Nightclub and Funk in the Funk Zone events drew packed houses and lines around the block. You can catch her spinning curated setlists for the New Noise Music Festival/Block Party and in between bands at the SOhO Music Club and Velvet Jones. The sole female DJ at Playback Recording Studio's 24-hour DJ-marathon, she has also graced the stage at the Lobero Theatre, historic Stowe House, Montecito Country Club, Art Foundry, Santa Barbara Auto Group, Celebration Cruises, University Club, Santa Barbara Club, Brooks Institute, Elings Park, Figueroa Mountain Brewery in Solvang, Carr Winery, and AVA Winery. Darla has played at the Roller Disco at Earl Warren Showgrounds; opened at rock concerts, art exhibitions, and book signings; provided screening soundtracks for UCSB Arts & Lectures Summer Movie Courthouse Series; played seasonal events for Santa Barbara High's VADA Institute and American Institute of Graphic Arts (AIGA) and the Santa Barbara Summer Solstice group. An audiophile from a musical family with its own background in broadcasting and concert performance, her popular 2-hour KCSB-FM 91.9 radio program "Rock It Properly" ("Santa Barbara's School of Rock"™) creates lively lessons on a range of artists and genres: Rock, House, New Wave, Hip Hop, Funk, Punk, Soul, and Disco. Local and regional bands and musicians love Darla Bea's weekly show as she continues nail what Rock 101 is all about. On the air and in her public performances alike, DJ Darla Bea's eclectic setlists are wildly successful with a wide variety of musical tastes. Her work has been recognized on-air by notable celebrities from Jack Black to Jeff Bridges. DJ Darla Bea's total package is all the more engaging thanks to her confident microphone skills and winning sense of humor. With DJ Darla Bea your event is guaranteed to ROCK!